For older audiences, Creed is a welcome return to the world of the Italian Stallion sunsetting into his golden years with the same heart that generations have come to love. For younger audiences, Creed is a great introduction into the world of Rocky...as well as teaching some great life lessons. Aside from boxing, the Rocky Balboa films have always been an analogy on life. Whether it is through the actions of the Italian Stallion (Sylvester Stallone; The Expendables, Rambo), or through little anecdotes as the quote above. It is with this tradition that Creed continues the legacy of the films that started back in 1976. 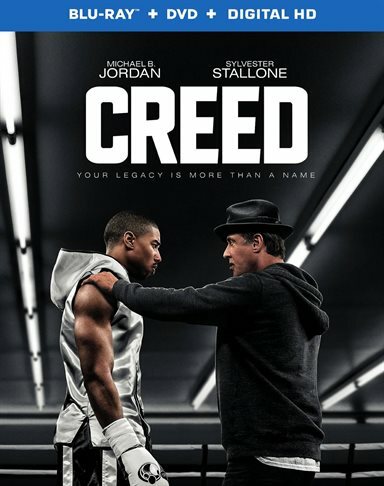 Creed follows the story of Adonis Johnson (Michael B. Jordan; Fruitvale Station), a troubled kid, having bounced around foster homes and, eventually, landing in Juvenile detention. Johnson's whole life changes when his deceased father's (Apollo Creed) wife, Mary Ann (Phylicia Rashad;The Cosby Show) takes him in. Suddenly, Adonis finds himself living in a mansion with a woman who cares and makes sure he becomes educated and well mannered. A far cry from what his life has been like so far. As Adonis matures and becomes an adult, he begins to feel like he isn't living up to his potential and that he was meant to be something more. He quits his job and moves to Philadelphia in hopes to become a professional boxer with the help of his father's rival and friend, World Champion boxer Rocky Balboa. Initially reluctant, Rocky takes on Adonis and, after winning one high profile fight, they find themselves up against the reigning World Champion, who exploits the last name Adonis has no desire to use, that of his of father, Apollo Creed. Jordan was impressive in this role, able to portray the struggles that the life of a former delinquent has to deal with while haunted by the father he never knew. The rest of the cast did a great job as well, with veterans Stallone and Rashad showing why they have survived in this business for so many years. Newcomer Tess Thomson gave a decent acting performance, but paled in comparison to the others. Warner Bros. 1080p AVC-encoded of Creed is extremely sharp and crisp. The clarity of the original digital shines in the transfer. Colors are warm and blacks and strong. I am personally looking forward to the eventual 4K HDR release of this title to see the fully expanded color palette that will make this film "pop-off" your television. Along with the exceptional video, Creed contains a 7.1 DTS-HD MA lossless soundtrack that make great use of the surround sound. The dialog shines through on the center channel, while the crowd noise of the matches dominates the rear channels making you feel like you are actually watching the bouts live. Know the Past, Own the Future - The main featurette in the package. Hosts a variety of interviews with the main cast members as well as the director. Becoming Adonis - A quick featurette on Michael B. Jordan and his transformation into the main character of the film. Deleted Scenes - Over eleven different cut scenes showing various exposition for the film's main characters. While these scenes help "flesh out" the characters they definitely deserved to be cut to help with the pacing of the completed film. For older audiences, Creed is a welcome return to the world of the Italian Stallion sunsetting into his golden years with the same heart that generations have come to love. For younger audiences, Creed is a great introduction into the world of Rocky and Apollo Creed, as well as teaching some great life lessons. Download Creed from the iTunes Store in Digial HD. For more information about Creed visit the FlickDirect Movie Database.